Axel Douque of Ocean Independence in Switzerland writes in to say that he's now the central agent for sale of the 26m Ulyssia, Ferretti's pocket superyacht. 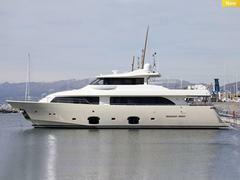 New in 2009, she's hull number seven of this popular series and is considered to be the quietest vessel in her class. MCA compliant, she accommodates 10 guests in a full beam master on the main deck plus four further cabins below, one currently serving as a gym and Turkish steam shower. Fitted with a gyroscopic anti-roll system, she's lying in Budva, Montenegro and is asking €5.29 million.